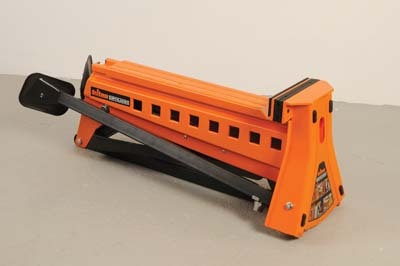 Triton were part of the Global Machine Company but have recently been bought by Toolstream, a UK company. With this move sealed, Triton are now putting their famed Superjaws back out there. As a former site joiner, I can tell you I took to them straight away. For me the jaws just have that usability factor. I'm a typical bloke, I guess, and I hate reading instruction (destruction?) manuals. So I'm pleased to be able to report that the vice is so simple to use, even I could work it out. Once the legs and foot lever were placed in the correct position, it was only a matter of seconds before I was locking in a bit of 75 x 50mm and bashing a few big nails in, and cutting it with a saw. The controls are intuitive. The locking and unlocking switch on the front works as expected, and the action on the foot lever is sure and positive. 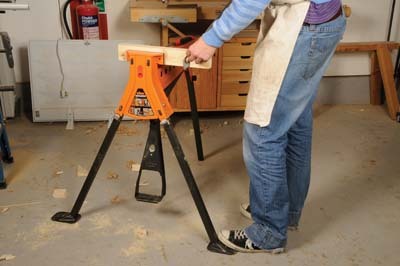 You simply push the moveable jaw against the workpiece then press down with the foot lever. If you've remembered to put the switch in the lock position, then your timber is gripped hard instantly. To release, put the switch in the unlock position, and then push down again. Easy as pie! The jaws can also be removed, turned around and replaced to give a massive clamping reach. is flexible enough to have uses in the workshop, too.